Hopefully you've seen Toy Story 3 at least once by now, so I'll tell you about my contributions to this film. Minor spoilers ahead, for those who haven't. This list is in chronological order as they appear in the film, not in the order I completed them. Operation Playtime - I did a few shots of Buzz and Woody after their plan to play with Andy fails. Buzz and Woody jump out of the toy box, look at each other, then Woody announces "guys, hold up, we need a staff meeting." Then he pulls some books over to make a stage and says "Slink, gather everyone up". Slink says "we are gathered, Woody". Woody is taken aback, then forges ahead: "okay, we all knew operation playtime was a long shot." These were my only shots with Buzz and Woody, and I wish I had gotten to do some more. I was nervous at first, but I found the Woody in particular was really fun to animate. Sunnyside - I did all the human characters in the shots introducing Bonnie. Andy's mom walks into the daycare holding the box of toys and starts a conversation with the woman behind the counter. Meanwhile Bonnie is sitting on the counter playing with a toy monkey. She reacts shyly to Andy's mom's attention, and then gets curious about what's in the box. She gets frustrated when she can't see inside it. These were some pretty challenging shots, since they featured full-body humans, lots of constraint switching, and were the first shots animated of Bonnie. I referenced my own daughters heavily for inspiration and reference. Bonnie's playtime - I did some shots of Bonnie playing with Woody. Having just spit out the "poison" jellybean she says "who would do such a mean thing? ", then turns to see Dolly. "Ah! The scary witch! Lookout - she's using her witchy powers!" She grabs Dolly, runs around the room and jumps on the bed. She holds up Woody and says for him, "I know where to hide!" Mrs. Potatohead's remote viewing - this is a looong shot of Andy picking up a box, walking across the room, setting it down, walking to the hallway, climbing a ladder, and looking in the attic. Then Mom appears and asks what he's up to. He explains to her about the trash bag he left in the hallway, and she realizes that she mistakenly threw the bag away, and he gets upset. All this happens from a locked-off, wide-angle camera with no dialog. At one point Buster the dog obscures our view, but I didn't animate him, just the humans. This was a tough shot - I had to shoot a LOT of video reference! Escape - I did the bet where Spanish Buzz first encounters Jessie. Starting with a slow-motions POV of her head turning to him and saying "Buzz", then he drops to his knees, grabs her hand, and extols her beauty (in Spanish). It was really tricky to find the right level of caricature and appeal in Spanish Buzz, and we were working in the shadow of Carlos Baena's work on that character. Goodbye Andy - Here I did some more shots of Bonnie as Andy approaches her house. She is playing with her toys on the ground: "Are you crazy? You'll wake up all the ghosts!". Then she pretends to throw pies, and when she sees Andy she calls to her mom. Later in the montage of her playing with Andy, I did the shot where she bounces Buzz on the cardboard box then bumps the toys in Andy's hands. He falls back dramatically and she laughs. If you look closely you will see that I've placed the Totoro at the base of the big oak tree, which seemed the right thing to do. i also did a couple of shots of the monkey staring at the monitor, but they're not really worth mentioning (though I just did). Overall I did about 1:40 of production animation (about 24 shots), plus a bunch of preproduction animation to test out the numerous background characters in Sunnyside Daycare - I think this is why I also got a "Character Development" credit. You can read an interview I did about my TS3 work on Animated Views for more details. Bonnie's scene on the daycare desk was adorable. At the time I wished her appearance wasn't so short, not knowing the larger role she would end up playing. Definitely noticed Totoro hanging near his natural habitat too. That pantomime shot especially was really awesome, to me it was one of those "Wow, who animated that?" moments, haha. I loved the pantomime shot as well! You've walked the fine line between overacting and clear communication very nicely with some stellar acting performances. But from your list the first shot of Bonnie stands out. I think this character is so convincing as a shy child who loves to play and has great imagination. From character type, writing, character design down to the great animation, I think the film's perfect ending convinces and emotes because of her. And her introduction sets up exactly the right tone for that brilliant pay off. Bonnie was my favorite human character in the movie! Looked pretty challenging. I'm going to watch it again in couple of more days. I want to look for Daisy. 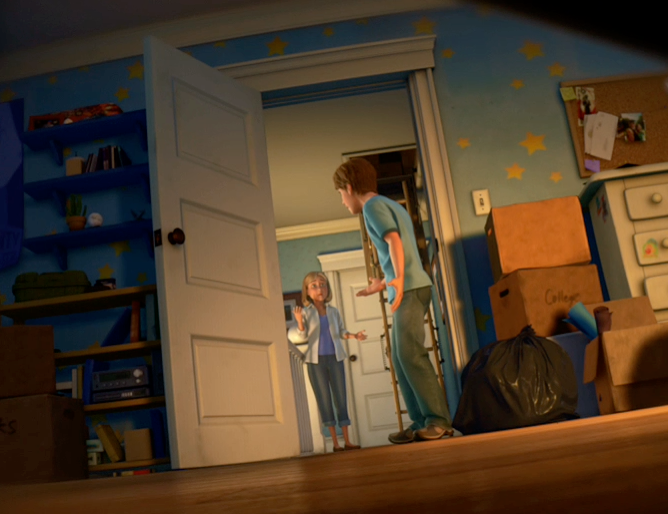 U know how there is a shot in "UP" that Lotso is next to the bed in this kid's room... I think would be awesome if that baby girl was Daisy! I don't think it was her in Toy story 3... I'll look for it this time. but how much time do you to complete a shot? 1 week? I would like to work at an animation studio some day. Really nice work Victor! Congrats to all of you who had something to do with TS3, it was VERY inspiring from it's animation, and it's storytelling. Finally got to see the film Monday night. Absolutely loved it. Your contributions were fantastic as always. I'm always struck by how each character isn't done exclusively by a single animator, but the character always seems so consistent. Well done!!! Nice work Victor. Sounds like you were super busy. Well done Victor on Toy Story 3. I especially liked your animation of Bonnie. I have had a great time researching your philosophy on animation and film making. Great work Victor, Goodby Andy sequence was amazing, really the best ending for a trilogy ever... Kudos to the writing. here in france, we're all crazy about this film, thanks you for your animation contribution ! Vow! I was just looking for a references for my mermaid photoshop painting and found your drawing. Clicked on your blog and see this post about Toy story, which I went to see today! Amazing story line, great animation and I wish all of you, who worked on this to see the reactions of the audience (all positive). Keep up the good work. Hope to see you up in the Bay area sometime soon. Yeah kids just love this movie! And great work from you. Appreciate it. So... What are you doing this weekend?